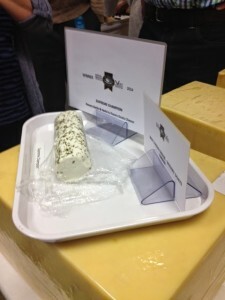 Last year I went to the BBC Good Food Show courtesy of Barber’s Cheese and got to try their lovely cheese for the first time. This year, things got a bit more serious and I was invited to The Bath and West Show to take part in a cheese toastie off (as well as having a good nose around the show). For my toastie recipe I wanted to keep it simple so I went for a sort of croque-monsieur; smoked ham, Barber’s Cheese, English mustard and plenty of butter on both sides of the bread. You can’t go wrong with butter. I didn’t win the toastie competition but I did get to have a catch up with Urvashi (the Botanical Baker), meet some fellow bloggers and also have a chat with one of the original Barber’s about their cheese. 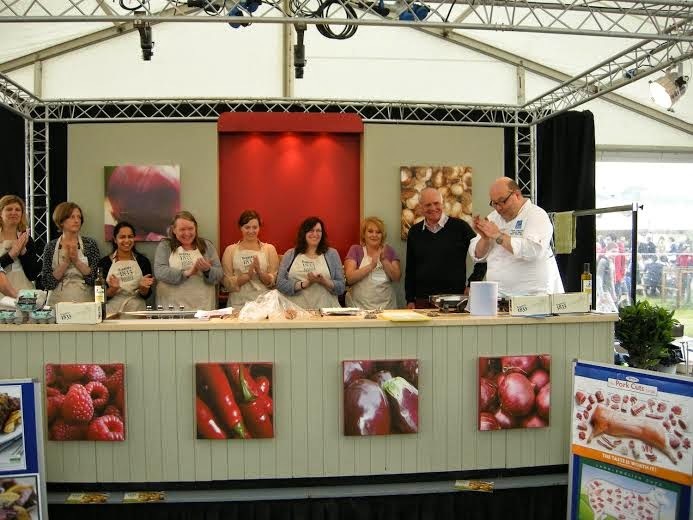 The recipe that won was from Fromage Homage who used Barber’s cheese, bacon lardons and caramelised onion relish; it sounded amazing so I have to try it soon. It’s always nice to get out and have a roam around these shows. The Barber’s stall was right outside the British Cheese Awards room and we got to sample some great British cheeses; crumbly Lancashire, the winning rosary goat’s cheese with herbs and a lovely herb and garlic cheddar. The one which caught my eye was the Cornish Yarg wrapped in wild garlic leaves as opposed to the normal nettle leaves. I’ll be on the lookout for that! We were sent home with a few tasty lumps of Barber’s to get cooking with ourselves. 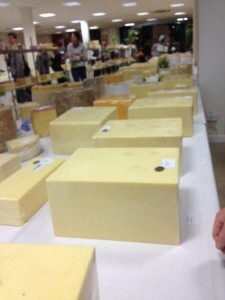 I have to say I prefer my cheese as it comes over being cooked (unless it’s on a pizza or in a toastie!) but when I found their recipe for pastichio I had to try it. 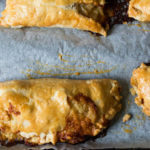 I had pastichio when I went to Greece a few years ago and I’ve always wanted to try it at home but, as with most of these recipes, I never found the time. This Pastichio recipe is from the recipe booklet from Barber’s. For the meat sauce heat the oil in a pan, add the onion and garlic and cook gently for 10 minutes or until the onion is soft but not browned. Add the mince and stir until browned. Stir in the cinnamon then add the red wine and allow it to bubble for a minute. Add the tomatoes and mint and season. Simmer very gently for 40 minutes until thickened. Meanwhile cook the macaroni as directed on the packet but take care not to overcook. Drain well. Heat an oven to 180C. 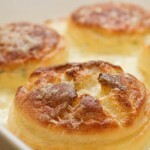 In a saucepan melt the butter then stir in the flour and cook for a minute. Gradually add the milk and cook for 5 more minutes. Add half the cheese and the nutmeg and season with salt and pepper. Add the macaroni and egg into the sauce. 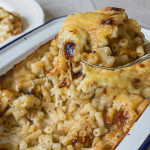 Spread half the macaroni in the bottom of an oven proof dish, cover with the meat sauce then top with the remaining macaroni. Sprinkle the rest of the cheese on top. I was surprised to find this was made with minced beef; I think the one I tried before was with minced pork. The pasta I had this with in Greece was like a very long macaroni tube rather than the shorter macaroni I used. I really enjoyed this. Although it feels like quite a wintry dish the cinnamon and mint really lift the beef to make it light and aromatic. 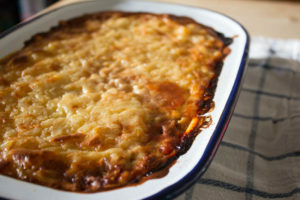 It was sort of moussaka crossed with Bolognese and macaroni cheese; a new favourite I reckon. 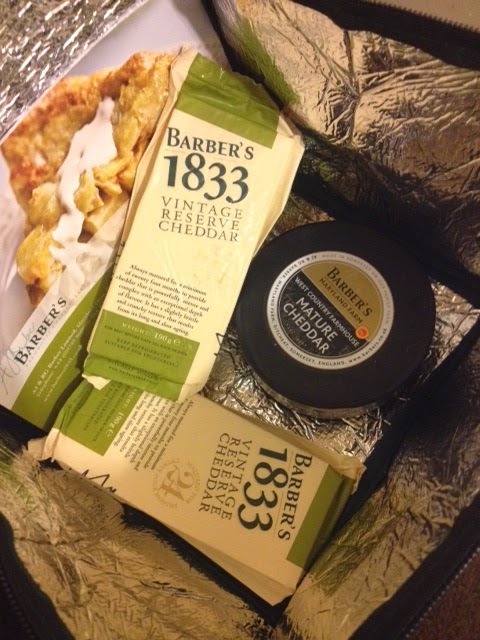 Thanks to Barber’s for the invite and the cheese. All opinions expressed are my own.